Have you ever tried to make your own salad dressing? 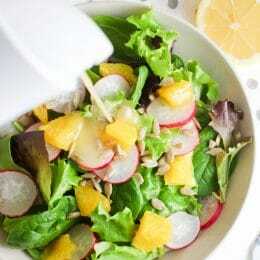 Super simple citrus dressing is a great starter recipe, and it even makes a great addition to a seasoned dressing recipe collection. 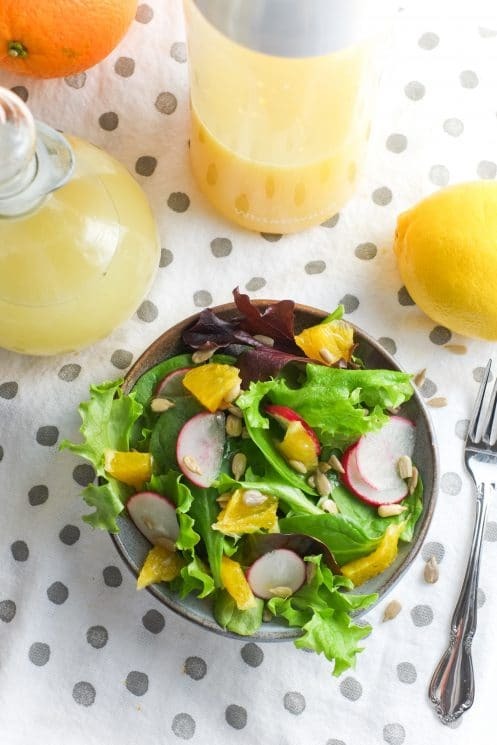 Learn how to make citrus dressing two ways – one sweet and one savory – with only 5 ingredients each! Fresh, delicious, and incredibly easy. But things changed when a friend introduced me to her family’s famous lemon dressing – “Dave’s dressing” they call it. It’s fresh, tangy, and just plain delicious. I was surprised to learn just how simple the recipe is! Inspired by this lemon dressing, I decided to try my hand at another citrus blend. This time, I went for a sweet dressing. And I came out quite successful, if I do say so myself. I may now be fully converted homemade dressing maker. 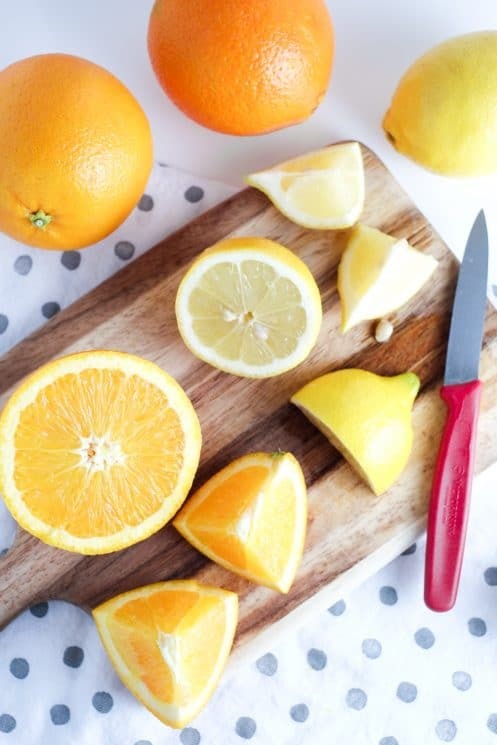 We love citrus fruit because they’re just as nutritionally vibrant as they are colorful! They have lots of fiber, vitamin C, and flavanoids. They’re great for your immune system, help with iron absorption, and taste so fresh! We’ll start with the dressing that started it all. To make this lemon garlic dressing, all you need is a lemon, some vegetable oil, garlic, and salt and pepper. Simply mince a couple cloves of garlic, then toss them into a jar or other dressing container. Add 1/2 cup vegetable oil, the juice of one or two lemons (depending on your desire for strong flavor) and salt and pepper. Seal everything up and shake! If that’s not simple, I don’t know what is. 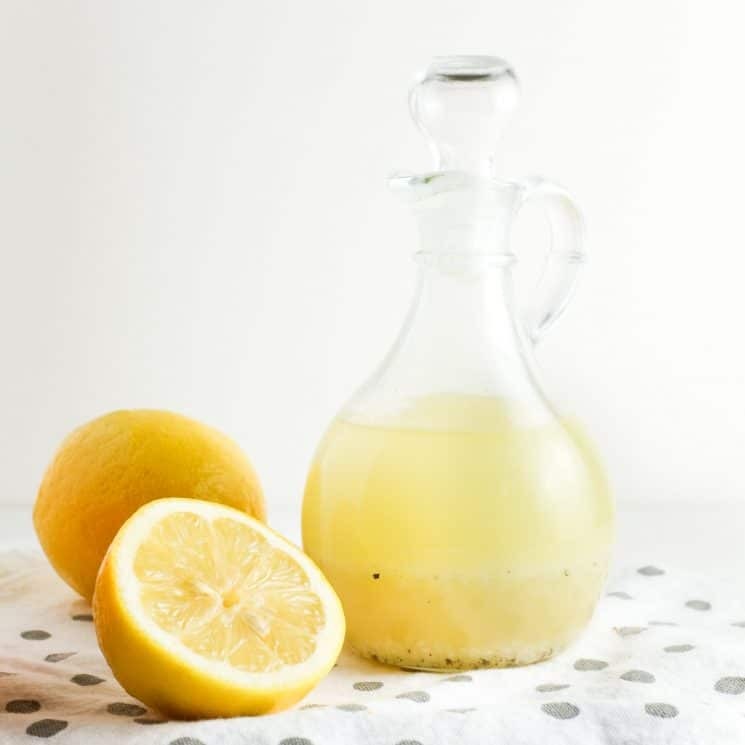 In case you don’t have fresh lemons on hand, you can use lemon juice from a bottle. If you do this, I believe about 3 tablespoons of juice is the equivalent of one lemon. But use fresh if you can – I think it tastes better! I love this dressing for salads – but it goes beyond that! I pour it over quinoa and veggies topped with feta cheese. Or use it to marinate chicken. It’s really fabulous and I always run out of it and make it up regularly now. It lasts at least two weeks in the fridge. Now for my honey orange dressing. It’s a recent addition and already I’m in love. 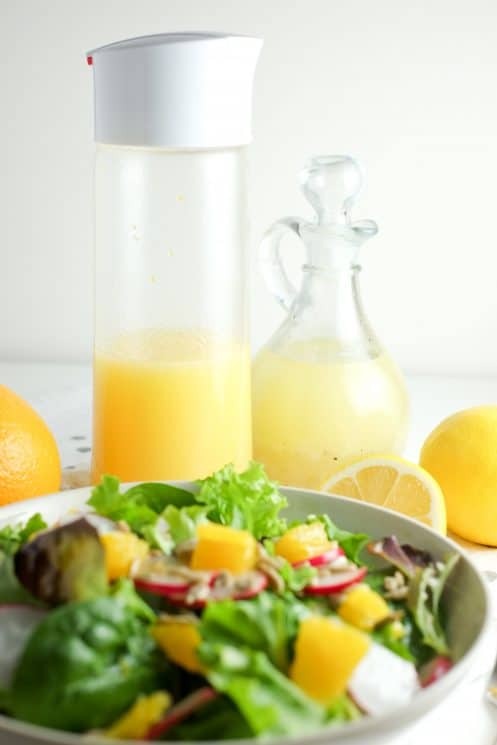 It’s a more subtle citrus dressing – slightly sweet rather than zippy and tangy like the lemon dressing. Perfect for kids who like softer flavors! 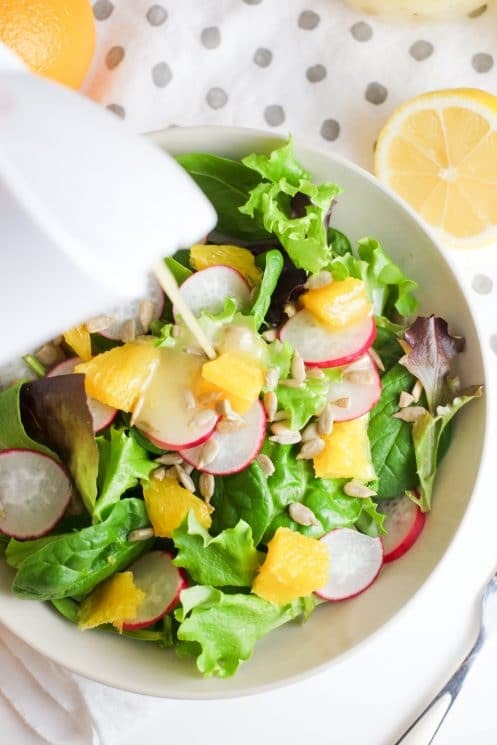 Oh boy, do I love this honey orange citrus dressing on salads! And I haven’t tried it as a marinade yet, but I have a feeling it would be amazing. For this dressing, I started with nearly the same base as before – vegetable oil and lemon juice. I just reduced the lemon juice to about 2 tablespoons, then added the juice of half an orange, or about 1/4 cup. Then I drizzled in 2 teaspoons of honey for flavor and sweetness. You can even add a few pinches of orange zest if you want to make the orange stand out even more. Now shake it up! Eventually the honey will dissolve. The only annoying thing about homemade dressing is how quickly it separates. 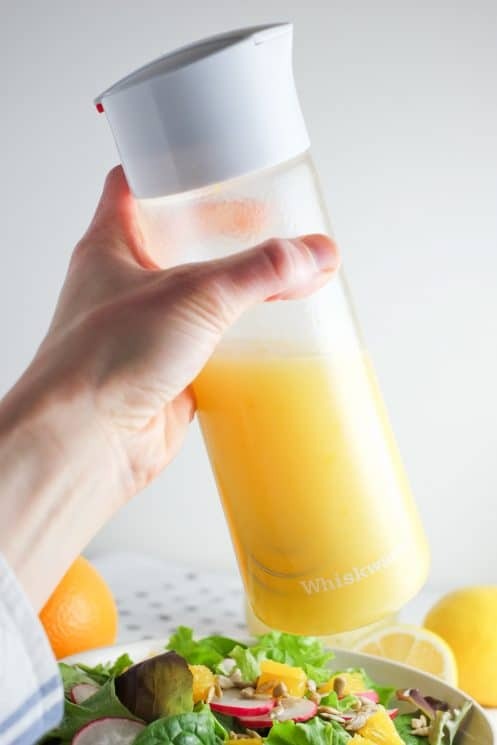 For a fantastic dressing bottle that helps to get everything nicely mixed, check out the glass one made by Whiskware from Blender Bottle. It’s got a metal blender ball inside to whisk, and an easy pour spout that closes so you can whisk between each pour. It’s especially nice for this dressing because it helps the honey mix in really nicely. 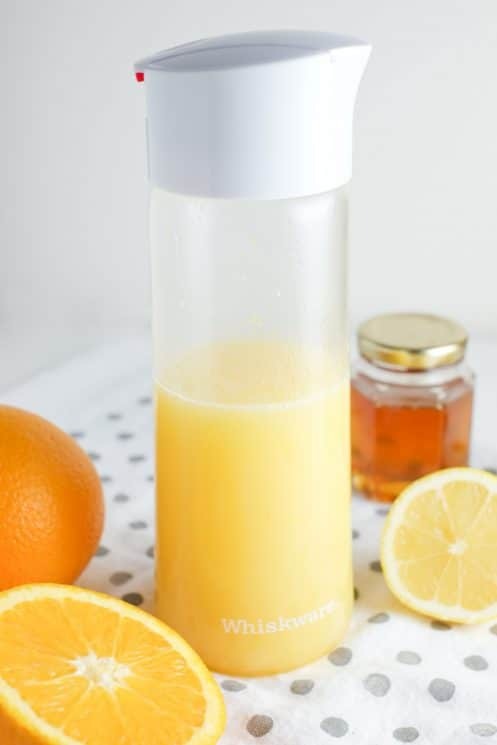 I love using this bottle for homemade dressing! Are there any homemade dressings you just love? We’d love to hear! Juice lemon and/or orange (if using). Mince garlic for the lemon version. Zest orange if desired for orange version. Whisk or shake together all ingredients until well blended. Pour on salad or use as a marinade. Refrigerate for up to two weeks. Whisk or shake before each use. It can’t be 505 calories, is that correct? No – that isn’t correct! Sorry about that. The recipe is updated now with the correct nutrition info 🙂 . Thanks for catching that one for us! that was real inspiring!! I love the lemon and garlic!! I also tried a salad dressing with orange juice, olive oil, red wine vinegar, garlic, salt and pepper with roasted almond slices on the salad as a great crunch… Turned out too good!! Hai mam really it’s nice salad I try in my home good looking, awesome taste.